A company’s success requires more than a business strategy. It requires flawless execution, which means employees - a company’s most valuable asset, must understand their roles and performance expectations. This level of coordination and flexibility required cannot be achieved with paper forms, standard data, silo HR processes, and HR focused exclusively on administrative tasks. HR Solutions offered by Hard Shop are the only web-based solutions that can help align employees with a business strategy while also making your HR professionals more efficient, strategic and critical to a company’s performance. 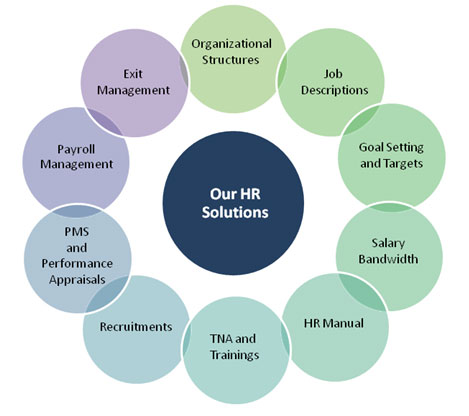 HR Solutions provide all of the talent management technology tools and HR consulting services needed to manage workforce strategically and to gain a competitive advantage..
“eMpower” is one of our Web/Intranet based Time-Attendance & Leave Management software product which is designed and developed by our own in-house experienced and qualified software development team under the guidance of our management team. Assigning of Shift to Employee, in which we can set whether employee will be having Fixed Shift or Rotating Shift( working in different shifts every week) and at what Constant Days the Shift changes. Over Time calculation settings. Many organizations provide Canteen as an additional subsidized facility to their employees as a welfare measure.